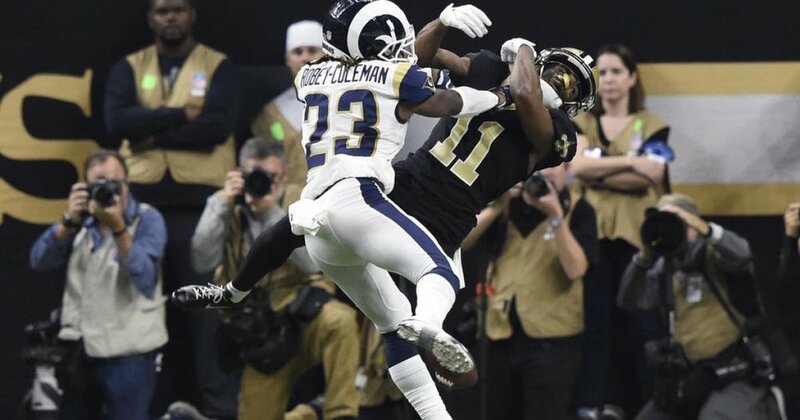 They’re still talking about officials’ failure to call pass interference on Rams cornerback Nickell Robey-Coleman in the NFC Championship game against the New Orleans Saints. Photograph by John David Mercer. But no, no, and right there I knew that the Rams were going to win the game. Since then, Robey-Coleman has received death threats while the state of Louisiana has protested to NFL Commissioner Roger Goodell and New York Times columnist Frank Bruni has found in the blown call and poor officiating overall in the NFC and AFC Championship games metaphors for Trump’s America. Of course, officiating should be held to a higher standard, and Goodell’s typically tepid we’re-going-to-improve things response would madden anyone. But having spent a lifetime watching sports, I tend to agree with tennis’ Andre Agassi, who once observed that the calls that go against you are balanced by the ones that go for you — and maybe shouldn’t have. Sometimes you can’t catch a break for trying, but every once and a while you do. That’s sport — and life.